I get quite a few emails and questions about how I set up to record my pours and what my pouring area looks like. Today I’ll show you the equipment I use, and how I have it set up. Now of course this isn’t the only way you can do it, nor the only equipment you can use. A lot of people probably use their cell phones, but this is what works for me and might give you some ideas for how to record your own videos if that’s what you would like to try. I have a two-camera system. An old video camera that is fixed over my desk and points straight down over the pouring action and another one set up opposite me so that I can capture front-on film too for when I am chatting at the camera and explaining things. Makes it more interesting than just staring down at the blank canvas. In the video, I show how I have it set up and the equipment I use. All of the links for my bits and pieces are below the video. Video camera – this old Samsung F90 I use has seen better days now but is a good and reasonably priced camera with all the functions you need. 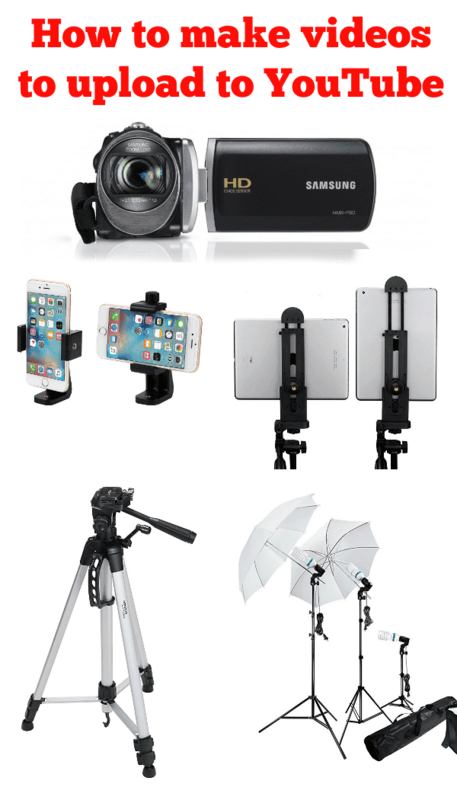 It takes HD video at 1280 x 720 and has a flip screen that you can turn to all angles so you can see what you are recording and also use the buttons from any angle too. You don’t need to spend a lot of money to get a good camcorder. Check out some of these HD camcorders. 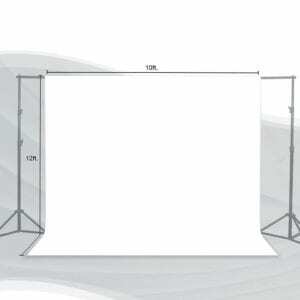 Support system – my support system for extra lighting and my looking-down video camera is this photo backdrop support. I used the cloths for drop cloths to protect the floor etc from paint drips. The support is adjustable both in terms of the width and the height. 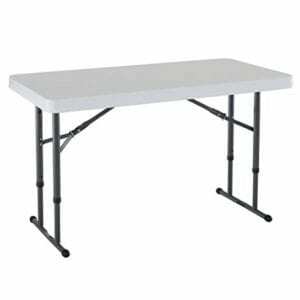 Adjustable table – I use this adjustable height table when I work. It’s the perfect height to work standing up, or you can shorten the legs to work sitting down, and it folds down flat to slide under the bed when you don’t want to use it. Video camera clamp – this is a GoPro ‘gooseneck’ bracket with a tripod style screw attachment so I can hang my video camera. Its really strong and can be used from any angle so I can attach it overhead, or pointing front, or from the side of the support bars if needed. I don’t tend to use the gooseneck part unless I have the camera set up on the side support and then I can point it anywhere I need to. Video camera screw bracket – in order to attach a regular camera or video camera to the GoPro bracket, you need an adapter that has a screw mount. 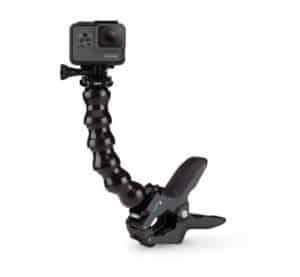 This fits into a standard GoPro fitting and gives it a screw fitting like a tripod so you can attach a camera, support bracket for your cell etc, or a camcorder. 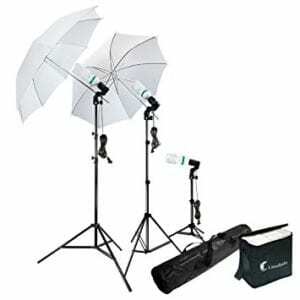 Lighting system – <this lighting system I use comes with three lights and two umbrellas should you want to stop the glare from the bulbs, but the umbrellas when open do take up a bit of room so I mostly leave those off so they don’t show in the front facing shots. 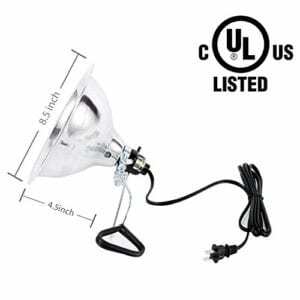 It comes with good quality daylight bulbs and all the three lights are fully adjustable. Clamp lights – can be used on the top or the side supports or clamped to a tripod or to the other light fittings. Buy them singly or in packs– they are really affordable. Gives extra directional lighting. Make sure to use daylight bulbs. I usually only use these in the evening, although I often use one to balance the extra light coming in from the window. Good for gloomy days or will work in place of the lights on stands above. 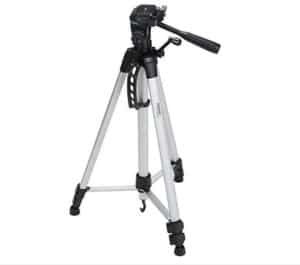 Tripod – this budget tripod from Amazon is anything but budget when it comes to its size and features. It has every feature you need, is more than tall enough and pretty sturdy. I love it. 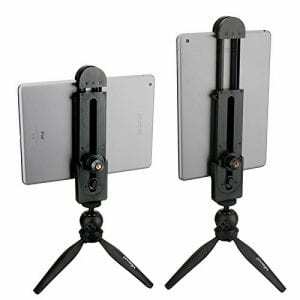 Tablet bracket – this is the bracket I use to hold my tablet to the tripod. If you want to use a cell phone, then check out these brackets which do a similar thing but are phone-sized. Tablet – I am now just starting to use my new Samsung tablet bought with the generous donations from my group members when my old tablet broke down. THANK YOU, EVERYONE. You made my life so much better now I don’t have to struggle for hours with malfunctioning equipment, and I should be able to make better quality videos and photos as a result. Video editing software – if you are only using a single camera, then there are a number of free and easy to use video editing softwares and apps you can use. If you want to get fancy with the dual camera set up then you’ll most likely want to get something that can splice the two videos together. I use Corel VideoStudio for my editing.